As a self-governing jurisdiction, Guernsey has developed its own system of taxation for its residents. In comparison to many other jurisdictions, tax in Guernsey is straightforward, the island caps the amount of income tax payable by residents and has no inheritance, estate or gifts taxes, no wealth tax, no taxes on capital gains and no VAT or sales taxes. Income tax is charged on individuals at the flat rate of 20% and the tax caps mean that the maximum annual tax liability for an individual “solely or principally resident” in Guernsey who has only non-Guernsey source income is currently £130,000 and £260,000 for such an individual who has both Guernsey and non-Guernsey source income (with the exception of income from Guernsey property). From 2018, newly arrived tax residents can benefit from a lower tax cap of £50,000 for their first four years living in Guernsey, subject to certain conditions. The basis on which income tax is charged depends on the taxpayers’ residence status for tax purposes and whether they are “resident only” or “solely or principally resident” in Guernsey. Broadly, individuals will be “resident only” in Guernsey if they spend more than 91 days but fewer than 182 days in Guernsey in a tax year and “solely or principally resident” in Guernsey if either they spend 182 days or more in Guernsey or are resident in Guernsey and not resident anywhere else in a tax year. The number of days is based on the same principle as the UK midnight test, where individuals are considered to have spent a day in Guernsey if they are on-island at the end of the day (midnight). As such, days of arrival are counted but days of departure are ignored. The Guernsey tax year is the calendar year and, unless separate assessments are requested, married couples are assessed jointly. Double taxation/unilateral relief may also apply to any non-Guernsey source income has already been subject to taxation elsewhere. at the rate of 20%. They can elect to pay the standard charge, which is £30,000 which covers any tax due on their overseas income and can be offset against any tax due on any local Guernsey income. 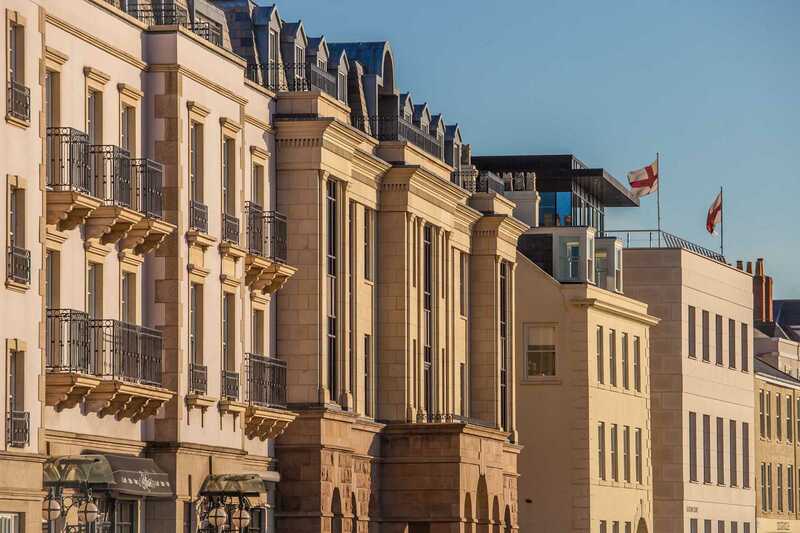 Individuals who are “solely or principally resident” are likewise subject to income tax in Guernsey on their worldwide income after relevant personal allowances and deductions at the rate of 20%. They can however benefit from tax caps. The taxation of non-Guernsey source income of an individual or married couple “solely or principally resident” in Guernsey is capped at £130,000. No election is required and any Guernsey source income will be subject to tax at 20% (e.g. employment income or dividends from a local trading company but not Guernsey bank interest which is considered as non-Guernsey source for tax purposes). pay £260,000 in any tax year. The cap does not include any income received from Guernsey property. £50,000 or more in document duty (i.e. has purchased an open market property worth £1.4 million or more at current rates). The foreign and worldwide tax caps are not limited in duration and are applicable no matter how many years the individual has been solely or principally resident in Guernsey. the individual became tax resident in Guernsey. This exemption is valid until the end of the second full year of charge since the individual became resident in the Island. The tax implications of the different types of residency can be explained by staff at the Income Tax offices or one could take advantage of the considerable amount of expert advice provided by professional firms in Guernsey’s accountancy, trust company and wealth management community. Guernsey Finance provides a business directory which provides a comprehensive listing of these firms. For information on tax caps for individuals click here. The tax regime in Guernsey is different to that elsewhere. For financial matters that may be complex, involve large sums or income from a variety of sources, discussions with expert tax advisors are recommended. Many are members of the Guernsey Society of Chartered and Certified Accountants and will be keen to provide tax advice. Guernsey uses the same currency as the UK meaning that English banknotes and coins can be used in the Island. Guernsey also produces its own locally issued banknotes, which include unique £1 notes in addition to all of the standard notes that can be found in the UK. Setting up a personal or business bank account is simple with the majority of the international banks being found in Guernsey, often as offshore subsidiaries. Business accounts can only be set up with proof of residency in the Island. English bank accounts can be easily converted to Guernsey based accounts. It is easy and simple to open a bank account or transfer bank accounts to the Island if this is where you, as an individual, and your business are based. Payment of Social Security contributions is mandatory and gives the employer and employee insurance protection and provides individuals with a number of benefits. New employers need to register with the Social Security Service. The contribution rate for employees is 6.6% of gross earnings, whilst employers pay 6.6%. Self-employed individuals pay 11% and non-employed individuals pay 10.4%. You’ll just need to register with the Social Security services team to get started. Applying for a registration or contribution card can be done here. Download our Tax in Guernsey Fact Sheet.